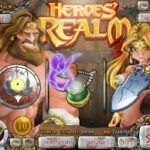 Heroes Realm is a 3 reels / 1 payline slot game released in 2011 by Rival. The first thing you feel when you enter the game is like being part of a magical and a mysterious world where any miracle could happen. Unlike classic 3 reels here you see only 3 symbols at a time on the reels. This keeps all the heroes coming and going and the game becomes really vibrant. There are also two scatters here. The first one is the Crossed Swords symbol. Landing 2 or 3 or more anywhere on the reels will reward you with 10 or 50 Free Spins respectively. The multiplier for those wins is 3x with a chance to re-trigger the Free Spins when landing more scatters. The second scatter is the Skulls symbol. Landing 3 of them will trigger the Bonus Round in which you’ll be asked to pick a hero. The hero now, under your guidance will fight in the village defeating monsters and winning you a nice prize. 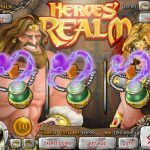 If you’re a fan of 3 reels you should certainly give Heroes realm a try. Despite the limited genre this game manages to deliver a very crisp and engaging experience. We are also very much in favor with the creative bonus features! If you’re a fan of classic 2 reel slot games then you should consider playing Gold Rush a 3 reel slot by Rival.